Alright guys, here we go again. Lets make it even bigger and better than the last few years. For this year, we'll be meeting at the parking lot in front of BOSCOV'S at the Montgomery Mall at 10:15am. We'll be leaving the lot as soon as our list arrives. I will be taking attendance via the list in this post so PLEASE! post up here and let me know if you're going. I will have name tags again so everyone can get to know each other. PM me or shoot me an email (justin.mondschein@gmail.com) if you have any other questions. To those who haven't had the opportunity to cruise to the meet with our caravan, I would 100% recommend joining in our group as we have had the largest caravan by far the last few years. Lots of awesome photo/video ops and tons of sick cars! When: Sunday, May 1st 2011. Where: Boscov's Parking Lot, Montgomery Mall. What to Bring: 2 way radios. 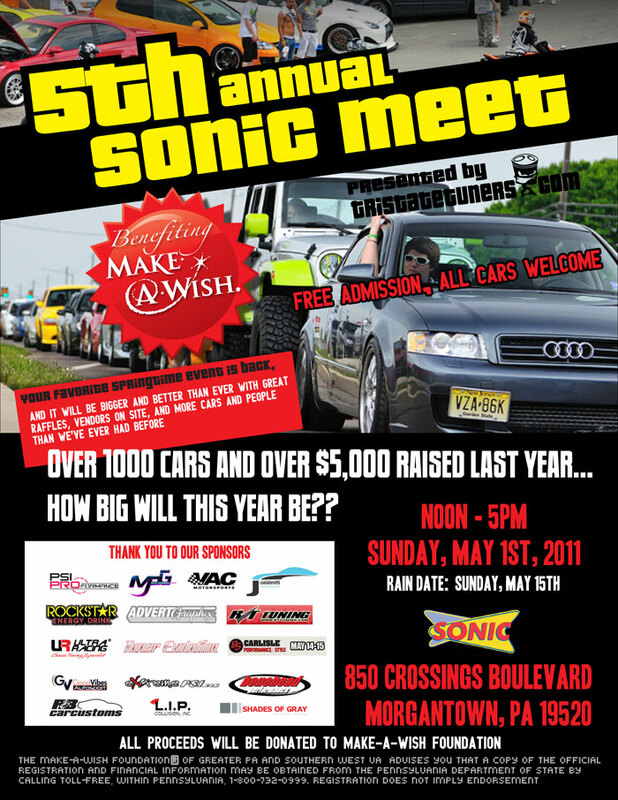 Here is a link to the official Sonic meet thread with more information & directions. Last edited by justinlansdale; 04-23-2011 at 12:40 PM. really, your not going to add me off the bat? you still have my megaphone right? yezzzzzir! you're part of the permanent backseat son! Well idk why im the only other person to comment on this but uk ill be thier with sexi lexi! I shouldn't even have to tell you this, but I will clearly be there! Send a private message to jen. Find More Posts by jen. "camden hookers and cars with no bumpers. The cars look (and probably smell) better." steph (paller) and I might be out for this. so far don't see why not. Wonder if Ill get burnt again like last year,lol. Put me and Kristy on the list Justin!!! !